Performers include: Mike Vogel, Rachelle Lefevre, Dean Norris, Alexander Koch, Britt Robertson, Colin Ford, Jeff Fahey, Natalie Martinez, Mackenzie Lintz, Samantha Mathis, Aisha Hinds, Nicholas Strong, Jolene Purdy, and Beth Broderick. An Army veteran, Dale “Barbie“ Barbara (Mike Vogel) is a handsome and enigmatic traveler who was passing through Chester’s Mill when the dome came down. He has a mysterious past that includes the reason why he was in the area. Julia Shumway (Rachelle Lefevre) is the editor of The Independent, the local newspaper. She’s an investigative reporter who recently moved to town recently with her husband, Peter, a doctor at the medical clinic who’s now disappeared. “Big Jim” Rennie (Dean Norris) is the owner of the region’s largest used car lot. He either commands respect or just buys it. He’s the only elected official left under the dome and his love for Chester’s Mill is surpassed only by his desire for power. James “Junior” Rennie (Alexander Koch) has spent his life growing up in the shadow of his father. Despite the scholarship he earned to play college football, he’s willing to throw that all away to stay at home with his one real passion, Angie, his date to the junior prom. When Angie rejects him, a hidden side of Junior erupts, just as the dome comes crashing down around Chester’s Mill. Angie McAlister (Britt Robertson) has had one goal — to leave Chester’s Mill forever. In the meantime, she’s been biding her time working the lunch shift at Sweetbriar Rose and as a candy-striper at the local health clinic. When the dome comes down, she finds herself trapped in a place she never imagined. Joe McAlister (Colin Ford) is very smart and has an adventurous spirit. He becomes entranced by the dome. His truck-driver father and his mother are both trapped on the other side of the wall, and his older sister, Angie, is missing. Joe may have a connection to the dome that he, and no one else, can quite explain. Sheriff Duke Perkins (Jeff Fahey) is the stoic face of this town who’s also had a hand in the town’s dirty laundry. For years, he’s mentored Linda Esquivel (Natalie Martinez), a young deputy with a soft smile but a hard edge. She’s trapped under the dome while her fiancé, Rusty Denton, is on the other side. Norrie Calvert-Hill (Mackenzie Lintz) is a 16-year-old girl who’s en route to a tough-love camp with her parents when the dome comes down. She’s a world away from her home in California, with a town of strangers. Like Joe, she also has a strange connection to the dome. Norrie’s parents are Alice Calvert (Samantha Mathis) and Carolyn Hill (Aisha Hinds), a pair of strong professionals from California. As they realize that there’s no way out of this strange town, they discover that they already know the other trapped people of better than they ever knew their neighbors back home. Phil Bushey (Nicholas Strong) is the DJ at Chester’s Mill’s only independent rock station and finds himself in charge of the only radio station able to reach the town. Dodee Weaver (Jolene Purdy) is the station’s brainy engineer, and possesses technical skills unmatched by anyone in the dome, which proves to be a great resource. Rose Twitchell (Beth Broderick) is the owner of the local diner, Sweetbriar Rose, where everyone seems to gather. Rose keeps the biscuits hot and the coffee fresh, and knows the comings and the goings of the town better than most anyone. As the Dome in Chester’s Mill comes down, the Resistance makes a final attempt to protect the outside world from the infected townspeople in the Kinship and their new queen. First aired: September 10, 2015. What do you think? 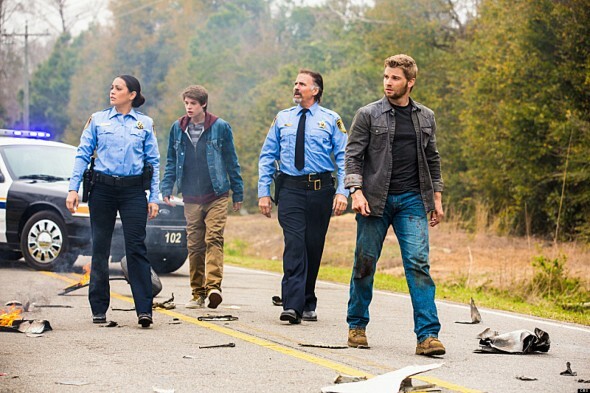 Do you like the Under the Dome TV series? Do you think it should end or should have been renewed for a fourth season? Another lost type disappointment??????? I mean what is the producers and directors are trying to do here? Such a great show, tragic case really. Come on even producers and directors were expecting better end than this. I LOVED Under the Dome. Would like to see it continue. Would like to see it continued into another season. The show was good up till the end when you would like to see what happens?